It's not what you have in life...it's what you make of life! Attention Monday Morning Cup Nation! You all have been asking for this...so here you go! Get access to our entire library of Monday Morning Cup of Inspiration Audios since inception. That's over 178 (and counting) of Dr. Elko's extemely popular Monday Morning Cup of Inspiration Audios all in one place. No more worrying about missing one in a particular week. You have access to all audios, all the time! 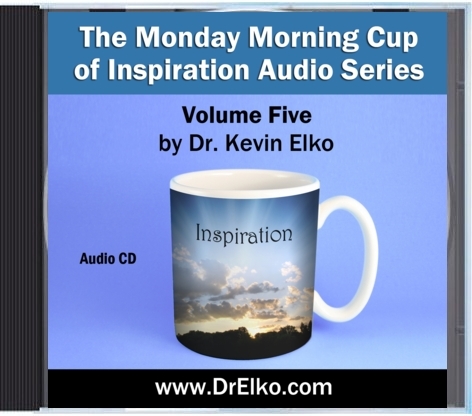 The Monday Morning Cup of Inspiration is a collection of short, motivational audio messages from Dr. Kevin Elko, designed to keep you focused on what is important and to help you handle life's daily challenges. Listen to your favorite messages while you are driving, relaxing after a hard day's work, gathering with friends or co-workers or whenever you need a cup of inspiration! Click the Add to Cart button below to get access to listen or download the entire Monday Morning Cup of Inspiration Audio Library (178 MP3 Audio Files and counting). After completing your order, you will directed to the thank you page where you will get your password and link to login. You will also get an email with this information. If You prefer the audios on CD, we have the following available at this time. What Story Do You Believe In? Get all five CD's in the Monday Morning Cup of Inspiration Audio Series for a special bundled price! Also, we are making The Monday Morning Cup of Inspiration Coffee Mug available! What better way to start the day than to sit back, relax and enjoy your favorite morning beverage while you listen to your Monday Morning Cup of Inspiration Audio Series! These mugs also make great gifts to your team, friends, co-workers, customers and family as a reminder to make the best of each day!